Follow-up Master's degree programme has a standard duration of 2 years (4 semesters). Candidates need to pass admission exam (except for the graduates of bachelor's programme "Theoretical Fundamentals of Mechanical Engineering"). The study is completed by a State Final Examination from the subjects defined for each field of study. The final examination also includes a defence of the thesis. Graduates are awarded academic title "engineer" (Ing.) upon successful passing of the State Final Examination and defence of the thesis. The field of study Applied Mechanics has always been part of the programme Mechanical Engineering. It is focused mainly on the field of continuum mechanics and with a closer focus on both the mechanics of solids and deformable bodies and environment. This field of study pays particular attention to deepening knowledge of both theoretical and applied physics and mathematics. The necessary mathematical tools enable the students to use computers for dealing with complex tasks from technical practice. This programme focuses on formation of highly qualified experts for research, development and practice of all engineering fields. The graduates are able to creatively use their knowledge of theoretical mechanics, elasticity theory, fluid mechanics and thermomechanics. They master analysis of dynamic systems, synthesis and creation of concepts of mechanisms, optimal dimensioning of machine components, assessment of lifetime of machines and testing of their reliability. They are able to work on challenging tasks regarding stationary and non-stationary, internal and external mechanics of incompressible and compressible fluids, theory of thermal calculations of machines and equipment. They will also become familiar with control of mechanical systems for active influence of their features in mechatronics. The graduates are able to utilize methods and means of engineering experimental research of machines and structures. The field Biomechanics respectively Biomedical and Rehabilitation Engineering is focused on training highly qualified experts for the field of biomechanics of man (musculoskeletal and cardio-vascular systems); moreover, it focuses on training constructors of medical devices, organ replacements, rehabilitation aids and equipment for social paediatrics. Furthermore, the graduates are experts for the operation of instruments in medical institutions and as such guarantee their technical and safety parameters and perform analyses of the measurements. This programme is a follow-up for a bache-lor´s programme of subjects of group A. It provides further knowledge of the field. Such combination of technical and medical disciplines creates a very interesting and demanded profile of the graduates who are able to creatively apply knowledge of theoretical mechanics, elasticity theory, fluid mechanics and thermomechanics, mathematical modelling and biomechanics – both in the field of development & research and in practical implementation of the procedures. Given the structure of subjects attended, the graduates can be directly integrated into medical teams as they will be well aware of the general medical issue, they can effectively communicate with the doctors over the specific cases also thanks to the fact that they are acquainted with the operation of diagnostic and therapeutic workplaces. The graduates may find suitable job positions in a wide range of companies focused on selling medical equipment. The field Biomechanics and medical instruments aims to train experts for the field of biomechanics of man, such as constructors of medical devices, organ replacements, rehabilitation aids and equipment for social paediatrics. The graduates are also qualified to work in State Administration Institutions. This field is focused on training highly qualified experts for the development and design of all types of machinery, especially for transportation, aerospace and handling and mechatronics sys-tems. The graduates are able to create concepts, detailed designs and documentation of ma-chines and systems. They have the necessary knowledge of the mechanics of solids and fluids, thermomechanics, strength of materials, life and reliability of machinery and automatic control of the machinery. They master procedures of design methodology and methods supporting the creativity of an engineer. They are able to analyse and specify problems in design, creatively propose concepts of how to tackle such issues, to perform a detailed concept and optimal di-mensioning of the machine or equipment and to assess its life and reliability. They also master methods and means of engineer experimental testing of machinery and construction. The applicants are required to have the knowledge of theoretical and preparatory subjects of bachelor's programme at the FME at CTU “Theoretical Fundamentals of Mechanical Engineer-ing”; if the applicants have not studied this programme, they are required to have completed another bachelor's programme and pass the admission examination. The theoretical base of previous study is deepened in specific orientations of the field: theory of combustion engines; theory of motor and rail vehicles; handling, building and agricultural ma-chines; theory of flight aerodynamics and mechanics; static and dynamic strength and lifetime of materials. These theoretical fundamentals form a base for mastering engineering simulation and experimental research and development. The students get acquainted with examples of the R&D in laboratory and project training courses. When participating in projects and/or writing diploma theses, the students work on topics assigned by production enterprises from the field and they participate in designing real vehicles, aerospace structures and their components. The graduates can find jobs as R&D experts, chief designers and project managers and chief testing engineers in the field of transportation and handling technology, off-road and rail vehi-cles; in the field of transport, construction and agricultural machinery; in the field of aircrafts, aircraft structures and air traffic and in reciprocating internal combustion engines of automotive, marine, aircraft and energy and aviation turbine engines. The students also gain a good base for doctoral studies in the fields related to technical mechanics, thermodynamics, machine design and modern aerospace technologies. This field of study provides deeper knowledge of heat transfer, mass transfer, fluid mechanics and energy transformation gained in the bachelor's programme “Theoretical Fundamentals of Mechanical Engineering”; this knowledge is deepened and applied in professionally focused coursed. The students choose a more specific orientation of power engineering: Combustion equipment and boilers, Thermal turbines, Industrial power engineering and Nuclear power engineering. There is a wide range of compulsory elective and recommended subjects which enable the students to choose the topic of their diploma thesis easily. This field of study trains experts both for the sphere of conventional and nuclear power engineering and renewable energy sources. The field Power Engineering, along with the fields of Environmental technology, Process engineering and Instrumentation and Control Engineering forms part of an integrated field Designing systems which consists mainly of huge participation of students in projects focused on the essential subjects which thus ensures quality education in the given sphere in spite of decreasing interest in the technical fields. Students of this field gain comprehensive knowledge of power engineering focused particularly on development, preparation of projects, designing and technology of power engineering machinery and systems. They are thus prepared to deal with theoretical and practical issues in various spheres of power engineering, i.e. production and consumption of energy, heat and cold. The field is oriented on creation of projects, design and operation of power engineering machines and equipment for conventional and nuclear power plants, refrigeration technology and heat pumps, equipment for exploitation of renewable energy sources and pneumatic and hydraulic machines. Naturally, there is also an emphasis on increase of effectivity, economic and environmental aspects of energy transformations. The graduates find jobs in development, research and design departments, as heads of power engineering departments in power plants, in the state administration and in the sphere of power engineering consultancy and audits. The field Mathematical Modelling in Engineering was formerly a part of the programme Applied Mechanics. It is focused mainly on mathematical solutions of problems of continuum mechanics with focus on environmental mechanics. This field aims to extend the knowledge of mechanics, mainly of the flow of fluids and gases. The necessary theoretical background enables the students to apply sophisticated mathematical tools in description of complex processes. The study aims at training of highly qualified experts for research, development and practice of all fields of mechanical engineering. The graduates are able to creatively apply knowledge of theoretical mechanics, theory of strength of materials, fluid mechanics and thermomechanics, mathematical modelling and biomechanics. They master formation of mathematical models for the analysis of the dynamics of systems, synthesis and creation of concepts of mechanisms, optimal dimensioning of machine components, assessment of lifetime of engineering equipment and testing their reliability. They are able to deal with complex stationary and nonstationary internal and external tasks of mechanics of compressible and incompressible fluids, theory of thermal calculations of machines and equipment. The students also get familiar with control of mechanical systems and active influence of their features in mechatronics. They also master the methods and means of engineering experimental research of machinery and construction. The graduates are suitable for a wide range of jobs which require the use of mathematical and physical models and use of models to gather information on behaviour in real conditions. The aim of this field is to train experts who are able to apply most complex mathematical processes in dealing with practical issues. Graduates can find jobs especially in research and development teams as well as in the field of control and modelling of complex processes. This field study is focused on training highly qualified experts in research, development and practice of all engineering fields. Graduates are able to creatively apply knowledge of theoretical mechanics, theory of elasticity of materials, fluid mechanics and thermomechanics. They master analysis of the dynamics of systems, synthesis and creation of concepts of mechanisms, optimum dimensioning of machine components and testing their reliability. They are able to work on challenging tasks regarding stationary and non-stationary, internal and external mechanics of incompressible and compressible fluids, theory of thermal calculations of machines and equipment. The training also regards interdisciplinary fields such as mechatronics, biomechanics, mathematical modelling and aerodynamics of the atmosphere. The graduates also learn how to use methods and means of engineering experimental research of machines and structures. Graduates of mechatronics at FME are engineers graduated from mechanical engineering field and thus prepared to work in mechatronic team. They will find suitable jobs in all spheres regarding creation of concepts and manufacture of mechatronic products which are very often quite unusual. This field provides not only classical engineering disciplines but is extended by modelling and simulation of mechatronic systems, theory of computer control, electronics, microprocessors and signal processors, artificial intelligence, conception methodology, methods of support of creativity, software engineering. Graduates of this field are highly qualified experts in the field of research, development and practice of all mechanical engineering disciplines using mechatronics as a synergy of machines (physical systems) with electronics (data processing) and intelligent computer control (complex decision-making processes). The students gain knowledge of modelling of machinery and construction and their experimental research while studying applied mechanics. The aim of this field is a formation of an engineer and designer who is able to apply knowledge of typically mechanical engineering fields based on mechanics of bodies and systems together with knowledge of electrical engineering which enables them to work particularly in the field of development of new appliances. The field of study is focused on mastering means of automatic control, informatics and instrumentation technology including microcomputer programming languages and applications. The graduates can subsequently apply this experience in their own creation of projects of complex control systems. Furthermore, the field of study is systematically concentrated on the enhancement of knowledge of operating and data base systems and computer models which can be applied in all technical applications and not only in mechanical engineering. The target of the programme is to train professionals who will easily find jobs in areas such as development and management of extensive data base systems and creation of control applications of technological systems. Owing to the extensive theoretical base of study, the graduates can apply all tools of applied mathematics and mechanics in operation and adaptation of control systems, information systems and systems of instrumentation technology. concepts and designs of standard and special measuring instruments (i.e. instruments for measuring pressure, flow, temperature, power, acceleration, revolutions, etc.) and special instruments (using nanotechnologies, ultrasound systems for detection of inner defects of material, special visualization instrument, photo cameras, etc. ), including those for the support of scientific research (telescopes, photo cameras, etc.). Further fields are modelling and optimization of properties of controlled systems (e.g. energy distribution systems, technological equipment of buildings, long-distance hot water transmission networks), concepts of control systems of indoor environment of the interior of buildings, analyses of complex power engineering systems (boilers, turbines and power units) as well as automation of machines and equipment for processing industry. Graduates are experienced in the use of software tools with artificial intelligence for the support of decision-making of operators of complex systems. The common theoretical fundamentals are extended by professional disciplines focused on transfer of momentum, heat and mass and on physical chemistry. Among the characteristic and profile courses are hydromechanic, thermal and diffusion separation processes and reactors and also courses focused on deeper knowledge of flexibility and strength of materials and mechanics. Students are acquainted with the theory of creating concepts of production lines and their designing within the given subject and other subjects focused on projects. An integral part of the curriculum is protection of the environment focused on sewage and gas treatment. The curriculum is oriented on the basic principles of conversion of raw materials, creation and processing of infinite and discrete objects, applied methods of transformation and modification of energy. Graduates master modern methods of obtaining scientific and technological information as well as methods of obtaining and processing experimental data. They are led to systematic designing and technical-economic assessment of process options, concepts of manufacturing lines and detail solutions of each machine and equipment system. They master designing and performing strength calculations of pressure equipment and creating concepts of production lines. A significant piece of knowledge the students gain is the use of computer technology in scientific and engineering calculations, collection of experimental data, control or process simulation, computer-aided designing with CAD methods, creating projects and utilization of computer networks. Mechanical engineers trained in this programme adapt very well in research, development and designing of machines, production lines and plants, in engineering and supplier companies and in companies using the technologies. They work in operational management, maintenance and repairs of fixed capital. They will find jobs mainly in the chemical, food and consumer-goods industries and also in the field of recovery and treatment of raw materials, power engineering departments, agriculture, pharmaceutical industry, service industry and other spheres of the infrastructure. This field of study trains experts for the middle and top management of engineering and other industrial enterprises. The graduates are prepared to use creatively their knowledge gained in the theoretical and practical lectures of operational, strategic and financial management, market-ing, quality control, enterprise economics, law, information technologies and human resources management. The graduates also have a wide knowledge of managerial methods and tech-niques, methods of statistical and decision-making analysis with application of information tech-nologies and thus are excellent at dealing with operative and strategic tasks in the enterprise. Technological courses of the programme and the connection of the study of managerial and economic disciplines with the previous extensive technical courses provides the graduates with technological and economic skills and knowledge which they can appropriately apply when deal-ing with comprehensive technological and economic tasks. The combination of technological, managerial and economic disciplines creates a very interesting and demanded profile of the graduates. They can find jobs in a wide spectrum of industrial enterprises in economic and also technological, production, marketing and logistic departments. The gained knowledge and skills predetermine the graduates for jobs in the middle and top management. The reached qualifica-tion enables them to find jobs also in trade and consultancy enterprises, financial institutions and in the state administration. This field of study trains experts for development and innovation, creation and control of appliances affecting the indoor environment of buildings, development and production of heating, ventilation and air-conditioning equipment. Graduates of Environmental Engineering are well trained experts for dealing with tasks in the field of development, creation of projects and design. 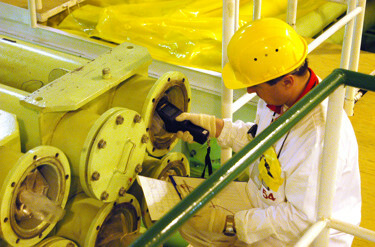 Besides theoretical knowledge of fundamental disciplines such as physics, mechanics of rigid and deformable bodies, graduates gain knowledge of the theory of fluid mechanics, heat and mass transfer, control and automation and they also gain knowledge of application of these disciplines in the field of environmental engineering including dealing with practical tasks and development of new appliances. The subjects of this programme further extend and apply the gained knowledge in the field of environmental engineering and the graduates thus gain wide knowledge in creating concepts, designing, development and innovation, creation of projects, technologies, assembly, operation, measurement and evaluation of environmental engineering equipment – ventilation, heating, air-conditioning, renewable energy sources, separating systems and also of equipment for noise prevention. The graduates will find jobs in the field of development and innovation of machines and equipment for environment engineering, in creation of projects of HVAC and heating appliances, in supplying and production companies, in the field of operation and service and investment departments, in hygienic services and in environmental protection departments of the state administration. The aim of the study is to provide the graduates with sufficiently broad knowledge who can find jobs in the field of development, creation of projects and in architectural studios and participate in the sphere of broad and nonstandard tasks concerning technological equipment of buildings including achievement of optimum indoor environment of buildings. They can also find jobs in the field of state administration, commercial and technical consultancy and representation. This field of study extends the theoretical fundamentals gained in the bachelor study programme. This theoretical knowledge is used in wide extent, developed and applied throughout the whole Master's degree programme. Students thus gain further knowledge of metallic, polymer, ceramic and composite materials, their processing and use in mechanical engineering and other fields such as biomedicine. They learn about methods of processing materials and evaluation of their utility properties from the viewpoint of the structure of the material, physical chemistry, thermodynamics and mechanics. Students gain broader knowledge of modern technologies of engineering production processes in a more extensive study of casting, forming, welding, heat treatment, surface treatment and machining including programming of machine tools. Students' fundamental knowledge gained in the bachelor's programme is further extended in subjects focused on structural and tool materials, engineering metrology, non-destructive testing, creation of projects, diagnostics and methods of prediction of the life of products in severe operating conditions. Students also attend subjects focused on management, rationalization of production of semi products, assembly and concepts of production systems and gain further knowledge in the field of management and rationalization of production and marketing. A synthesis of professional knowledge of materials engineering, technology of production processes and economics enables the graduates to find jobs not only in large engineering companies and small and medium sized enterprises but also in various research, project and trading companies and in the state administration. The combination of technological, managerial and economic disciplines creates a very interesting and demanded profile of graduates. Therefore they will find suitable jobs in a wide spectrum of industrial enterprises, namely in technological and production departments. The knowledge gained predetermines graduates for positions in the middle and top management. The achieved qualification enables them to find jobs also in trading and consultancy companies and also in the state administration. The program focuses on theoretical and experimental methods of designing production machines and handling equipment and ways of their operation. The programme therefore aims to deepen the knowledge of the areas of theoretical and applied mechanics and engineering and technology. Together with the fields of Mechatronics and Vehicles, aircraft and transport technology, it forms the basis of an integrated study program is Design which is directed to the areas of construction machinery and ensures an adequate and quality education in different branches even at decreasing number of students at technical universities. The profile of graduates from the programme Production Machines and Equipment is based on knowledge of the concepts of conventional and CNC machines, robots and manipulators in connection with their application in various technological dispositions of mechanical engineering. The programme also greatly focuses on teaching ways of research and development of new structures, machines, their components and promising applications of unconventional materials in the construction of machines parts. Graduates can find suitable jobs as project architects, constructors and also in departments of development, operation and company laboratories. They also have very good skills and knowledge to work as entrepreneurs focusing on the area of manufacturing machinery and equipment. The graduates may also teach technical subjects at all types of schools.